This was one of those glorious easy summer meals that just came together from happenstance. We were heading away for a long weekend, and I needed to use up as much fresh produce that I could. 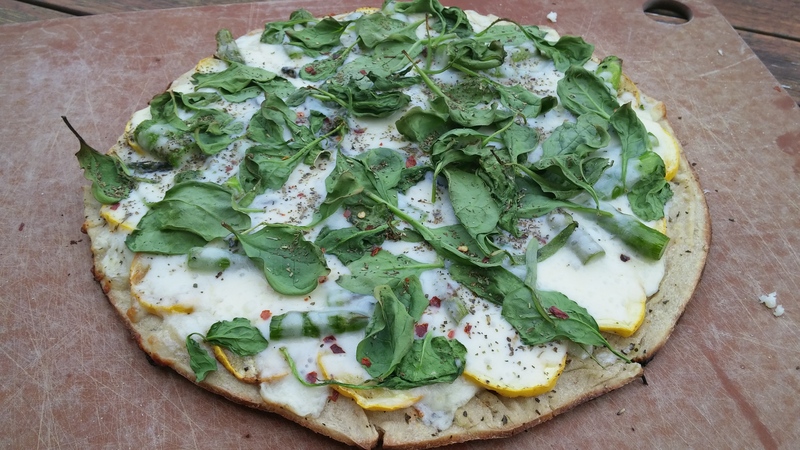 We had some wonderful summer favorites – summer squash, zucchini, and asparagus. Veggies alone aren’t a meal (to me), so when I remembered we had some flat bread in the freezer, dinner was set. Doesn’t it just look delicious? Start by heating up the oven to 450. Put the squash and zucchini on a pan coated with non-stick spray. Drizzle olive oil, salt, pepper, and garlic powder over the veggies. Stir around to coat the veggies and cook for 10 minutes. After the squash has cooked for 10, carefully flip over each slice and bake for another 5-10 minutes. You’re looking for just a bit of carmelization. Fire up the grill. Yep, we used the oven and the grill here. Once hot, sprinkle oil (or balsamic) and spices over asparagus, and grill under tender – maybe 5 minutes or so. Let cool, then cut into 2 inch long pieces. Be sure to leave the grill on – you’ll need it again. Next, get the flat bread ready. We used a packet of dressing that came with the flat bread for the top, but it was nothing more than oil and spices. When the zucchini and squash are ready, let them cool for a few minutes, then layer them onto the flat bread. Add the asparagus, cheese, spinach, and any other spices you want (we added a dash of red pepper too). Carefully transfer the flat bread to the grill. Close the lid and let grill until cheese is melted. You absolutely could make this pizza solely with a stove. I just craved that grilled flavor. If you do so, just roast the asparagus or cook on the stove top. Bake pizza just until cheese is melted and spinach is a bit wilted. I noticed we have some squash, zucchini, spinach, and a flat bread in the fridge this morning. Guess what’s for dinner tonight?